Pinterest founder Ben Silbermann took the stage at Internet Week in New York last week. Silbermann pointed out that Pinterest is not just another social network like Facebook, Twitter or even Instagram. Instead, it’s a tool for accessing the Web’s best images through content organized by other people. Pinterest is not another place to create a brand presence to “engage” with consumers. Pinterest is a tool for its users, and marketers should consider how they can use that to their advantage. Pinterest is not about connecting people with other people. It’s about connecting them with ideas and inspiration that they can make part of their everyday lives. Facebook and Twitter foster relationship-building, and the personal fulfillment comes from communicating about one’s self to personal connections and nurturing relationships through digital channels. Pinterest is more functional. It’s a tool one can use to get a job done whether that’s planning a trip, creating a list of recipes to prepare or something else. The motivation is almost completely selfish (in a good way). Pinterest is a means to an end, not the end itself. Silbermann and the team at Pinterest understand that, and they’ve taken steps to make pins even more of a utility with Rich Pins. A feature that embeds information like product availability for things like clothes and furniture, cook time for pins related to recipes and ratings for pins related to movies. All of this is in an effort to make Pinterest even more valuable for users than it already is. Silbermann stated, "The companies that I really admire the most are the ones that have a deep visceral understanding of why people use their service and they figure out ways of making money that are completely consistent with how people are feeling and what they are doing at the time." Marketers need to do a better job of understanding user motivations. We face challenges with Facebook, Twitter and other platforms because they don’t necessarily understand what we need to be successful marketers, but one they do understand is user behavior and what makes people do what they do online. That’s a lesson for any marketer no matter what is being executed. Understanding what fulfillment people get from online interactions allows us to understand how we can add value to that situation and improve their lives. 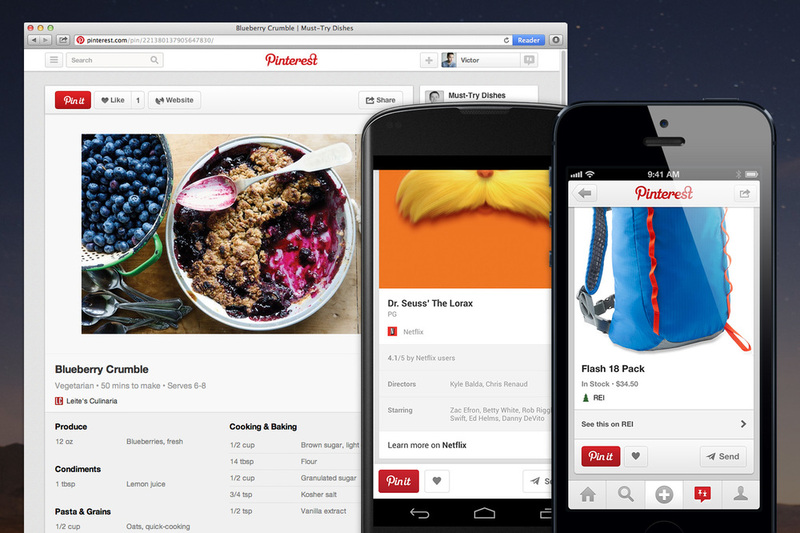 Pinterest is about curating content for users, not necessarily following brands. Brands often confuse using a platform effectively with having a branded profile. That’s not always the case. Because we understand the motivations behind using Pinterest, we can take a few things away as marketers on how to best leverage the platform. Get Visual – Everything is getting more visual online, but Pinterest is only visual. The time when brands can drag their feet on creating visuals is over. Images are the only way to be shared and reshared on Pinterest and a growing number of places today. Shareable Content – A brand’s website is its content hub. Images, text and everything else should have the goal of helping the consumer in one way or another to encourage sharing and distribution to other platforms. This means making sharing easy. Push from Discovery to Action – Pinterest’s Rich Pins are all about making Pinterest content more actionable. Marketers should use this mindset with Pinterest efforts as well as all social media marketing endeavors. Have something for every type of consumer such as visuals for the individual looking for inspiration and information for the consumer ready to make a decision and take action. Marketers have gotten used to seeing a new platform come out, creating a presence, building followers and sharing content. Pinterest and similar platforms should give them pause because it’s not about having a presence. It’s about understanding motivations and then creating content that has a propensity to intersect with those motivations. That way the brand becomes a natural fit for the toolset and not just an add-on trying to fit in. Posted in Pinterest and tagged with Pinterest, Ben Silbermann. May 29, 2013 by Taylor Wiegert.